’19 FORD GT CARBON: LIGHT HEAVYWEIGHT! ’17 FORD GT: AMERICA’S SUPERCAR! ’18 FORD GT: ’67 HERITAGE EDITION! DÉJÀ VU: FORD GT WINS LE MANS! 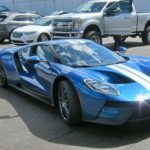 ’17 FORD GT: AMERICA’S LATEST ROAD & TRACK STAR! ROY LUNN: GODFATHER OF THE FORD GT40! $14 MILLION SALES: MECUM ANAHEIM AUCTION! 2016-’17 FORD GT: EVERYTHING YOU NEED TO KNOW! 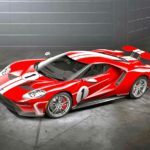 FORD GT: MOST SIGNIFICANT CONCEPT VEHICLE! 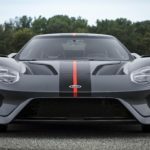 Production version of GT will appear next year, as will race version to celebrate 50th anniversary of legendary Ford GT40 1-2-3 win at Le Mans in 1966. The all-new Ford GT – a technology showcase for top EcoBoost® performance, aerodynamics and lightweight carbon fiber construction – today nabbed the prestigious North American award for 2015 Production Preview Concept of the Year, as well as top honors as Most Significant Concept Vehicle of 2015.